Over the recent years video has become a popular topic and the “go-to strategy” amongst key decision makers to increase a company’s brand awareness. In fact, the majority of consumers have come to expect videos from businesses. But how effective is it really? Why is it that some brands fail at video and don’t see any improvements to either brand awareness or conversion rates? Before analysing or speculating on the level of effectiveness, it’s important to establish some of the key challenges businesses may face today when it comes to video production. Navigating the internal battles for video production. In-house or a creative agency? Incorporating video into your marketing activities. Is there a strategy in place? Creating a compelling story delivered in the brands tone of voice. Humour or formal? Research suggests that visuals are processed 60,000x times faster than text and that people remember only 20% of what they read… but 80% of what they see. There is no doubt that producing a video to promote your business can be effective, but only if it’s done in the right way. Let’s explore the three challenges in detail with examples of powerful video marketing campaigns that have delivered great, measurable results. The need for video production in any business is clear, but there are still a few challenges to overcome like the cost and resource involved to produce a video. Let’s not ignore the quality of video production and what that can mean for a business. 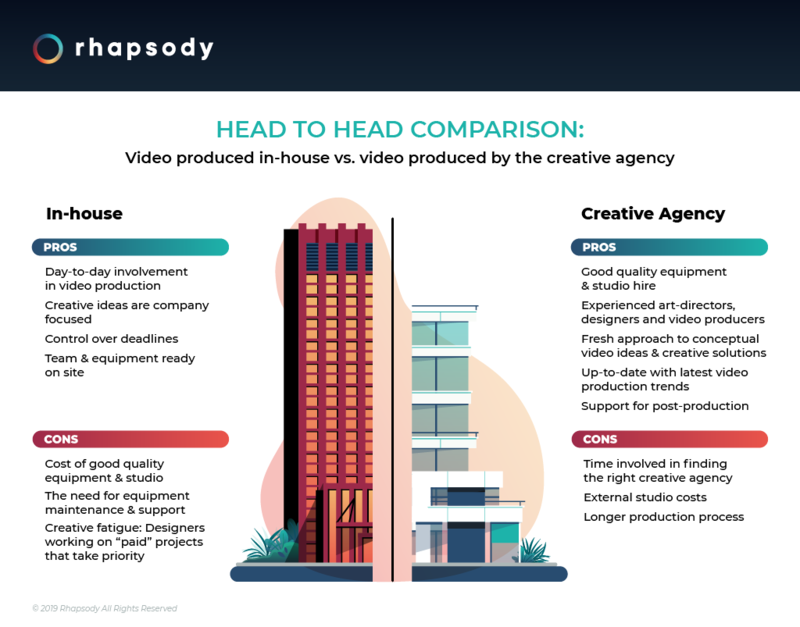 Below we share an infographic that analyses the pros and cons of both in-house and a creative agency. Incorporating video into marketing activities. Is there a strategy? Avoid creating “one-off” videos that are not part of a broader marketing strategy. This can be a costly process that doesn’t generate ROI. Read more on how to increase your marketing ROI with the help of a creative agency. A great rule of thumb to follow when creating an overall strategy is to ensure that each video is a part of a larger plan that meets the objectives of the overall marketing campaign. This can either be a promotional video to educate or an informative awareness video to promote a product or a service. Identifying specific KPIs for each video helps to ensure that the video is doing the job that it was intended to do. Here are some examples of successful video marketing campaigns. Squarespace’s “Make Your Next Move” campaign . Squarespace partnered up with Oscar nominee John Malkovich to produce a promotional video that encourages viewers to take the “next step” in their decision making. The use of emotional, true and in most cases relatable storytelling is an effective sales and marketing technique used by many. Business that decide to take this approach, could also use this type of video strategy to create an effective retargeting campaign which can potentially increase sale conversion rates. Always “Like a Girl” video campaign . This campaign received more than 90 million views and had a higher-than-average lift in brand preference. Purchase intent also grew more than 50% among the target market. How? By “finding an enemy” within their target market and creating an effective, emotionally empowering video message addressing commonly held misconceptions. In many cases, key decision makers think that they need to have a large budget for video production to see results, but that’s not necessarily true. If a video marketing campaign is strategic, well thought-out, and aligned to a specific objective, a one-time cost, can be a great long-time investment. Below you can find interactive video marketing stats & facts for 2019, which can be helpful in deciding what kind of video strategy you should choose. Creating a compelling story that portrays the right tone of voice. Humour or formal? It’s all about finding a balance and truly understanding your target market, distribution channel and most importantly the purpose of your video. No one wants to read, watch or hear any “dull” stories, however if you are working in a corporate environment and need to show a video about your business to a client, creating content that is humorous may not always be appropriate. Here’s how to determine whether your content should be humorous or formal or maybe even both. Establishing your target market is essential. Let’s take LADbible Group as an example, the world’s largest social publisher. Their content is aimed at the younger generation and they use a “fun tone of voice” for video production to drive social empowerment and engagement. In 2017 it was reported that the company had 33 million social followers and their website was ranked 10th biggest in the UK. By understanding and analysing their target market, the company has understood that using fun and humorous video content is what keeps their audience engaged. This statement, really underlines the popularity and effect of fun content. Analyse if this is an appropriate route you can take before video production starts. On the other hand, if the purpose of your video is to educate your audience or pitch a product or service to a client, a formal tone of voice may be more appropriate. Watch our video from Alert 24 project and see how they have successfully used a formal tone of voice to demo an awareness course “Safe Business Traveller”. Read full case study HERE. It is projected that by 2019, internet video traffic will account for 80% of all consumer Internet traffic. It may appear that creating a sophisticated video which drives action would be a high-cost endeavor with minimal ROI, but it’s quite the opposite. By understanding the challenges video production brings and knowing how to overcome them, you will have come a long way in ensuring your brand can increase its brand awareness and drive consumers to take the “next step” whether it’s buying a product or enquiring about a service. Are you looking for video production must have tips & tricks? 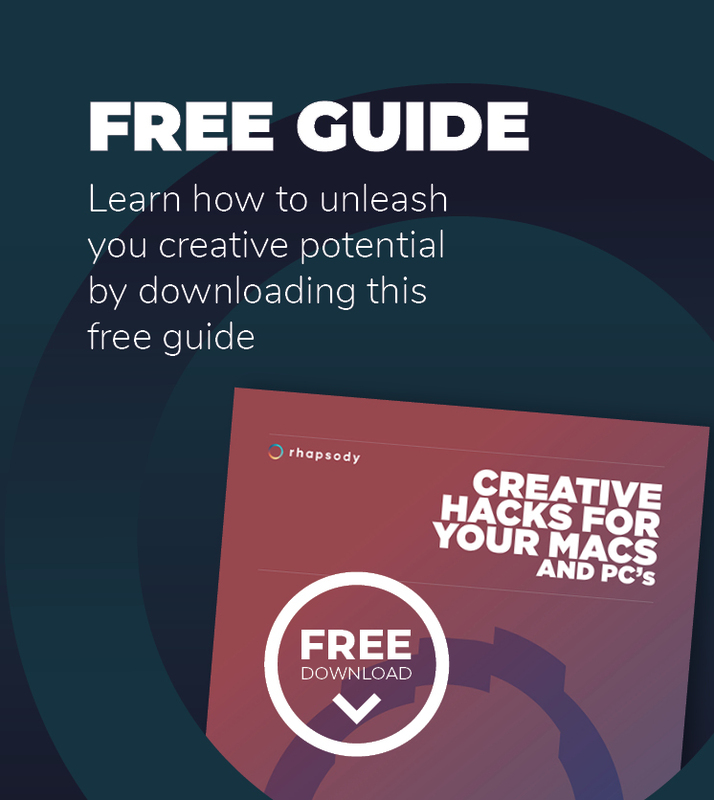 Download our “creative hacks for your Macs (and PCs too)” guide to receive 50 marketing tools including video production tips.